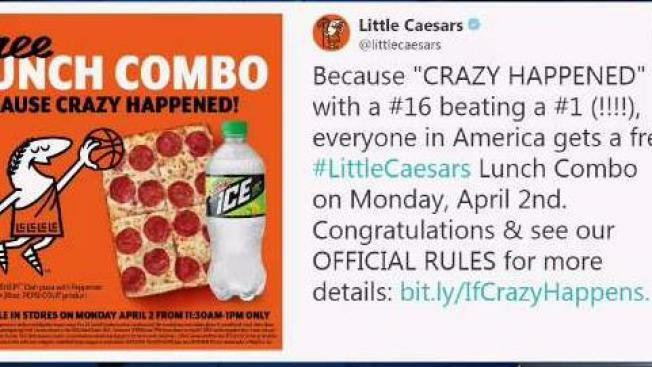 Little Caesars is offering everyone a free lunch combo on April 2 after a March Madness upset. Little Caesars will give away free pizza on Monday in honor of a historic bracket-busting upset during the NCAA March Madness tournament. Last month, the Detroit-based pizza chain announced if "crazy happened," like a No. 16 seeded team beating a No. 1 seeded team in the tournament, Little Caesars would serve up free hot-and-ready lunch combos. The odds of the University of Maryland-Baltimore County beating the University of Virginia were slim to none. But in a shocking upset, the UMBC Retrievers made history by becoming the first No. 16 seed in the NCAA men's tournament to beat a No. 1 seed with a 74-54 victory over the Virginia Cavaliers Friday night. On Monday, March Madness spectators (and pizza lovers alike) can eat their feelings with free lunch combos courtesy of Little Caesars. The meal, valued at $5, comes with four slices of their deep dish pizza and a 20-ounce Pepsi product of your choice. 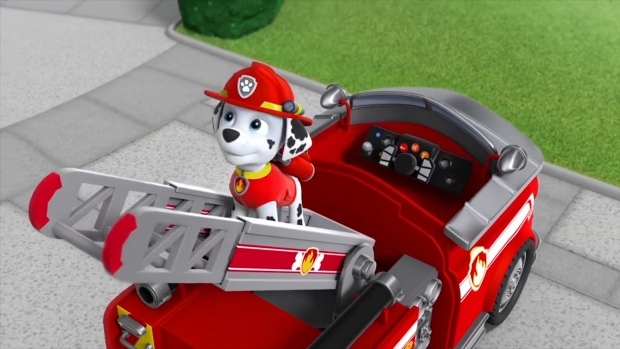 Most people didn’t have Marshall upsetting Wichita State in the men’s NCAA Tournament — that is, unless you have a pre-schooler who happens to watch “Paw Patrol.” Find out how a cartoon pup may have your kid winning your bracket. No purchase is necessary to redeem the offer. Customers can pick up their free pizza between 11:30 a.m. to 1 p.m. on April 2. The chain said orders must be placed before the 1 p.m. cutoff in order to qualify for the free lunch. Little Caesars says the offer is available at participating stores while supplies last. For more information, click here. 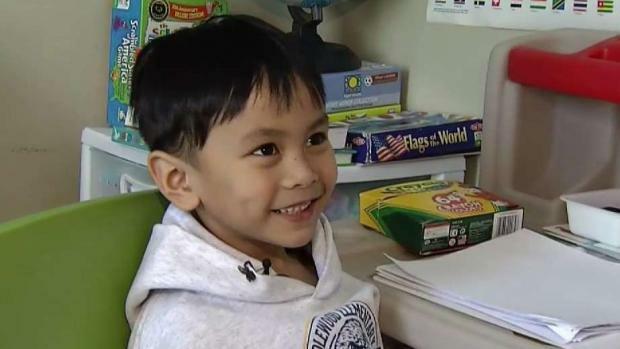 Joaquin Francis Ancheta is 5 years old and, like most kids his age, he loves pizza. But unlike other children, Joaquin has an incredible photographic memory. Memorizing all the NCAA basketball teams is his latest accomplishment. Erika Gonzalez reports. This isn't the first time the pizza chain has offered to give away free pizza if an underdog wins. Last year, Little Caesars pledged to serve up hot-and-ready lunch combos if NASCAR's rookie of the year Chase Elliot won the Monster Energy NASCAR Cup Series in Bristol, Tennessee, on April 24, 2017. Jimmie Johnson won that race.